The third volume in the War Stories: World War II Firsthand series is anchored on the words and experiences of 100 Marines, soldiers, sailors, airmen and other frontline personnel who became embroiled in the devastating island campaign of the Pacific War. Never before or since was so much blood shed for so little real estate. 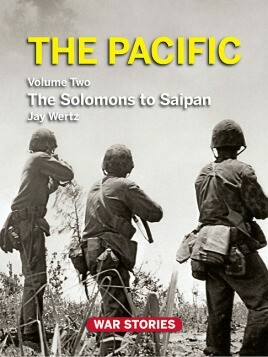 The volume contains blow by blow descriptions of some of the most destructive naval and air battles of the war, as well as the blood and sand tales of Marines and GIs and their Japanese counterparts contesting inch by inch places with strange names such as Bougainville, Tarawa and Saipan. The real-life stories of those who were there are illustrated with revealing photographs; some never before seen in any WWII volume. The 9" x 12" volume also offers original maps, enlightening narrative sidebars and a complete timeline of the Pacific campaign -- 1942-1944.